Victoria established a program to select a marine icon species for Victoria. This was an exciting opportunity to engage Victorians in learning about local marine life and to provide an opportunity to participate in the selection of an appropriate emblem for our rich and diverse marine environment. The "winner" was the Weedy Seadragon, Phyllopteryx taeniolatus. Visit the NRE website for more images and videos of the Weedy Saedragon. The "losing" animals suggested for the emblem can be seen here. Weedy Sea Dragons grow to a mature length of about 45 cm. Their name refers to the leaf-like appendages on their bodies. They use camouflage as their primary defense, and are found living among kelp-covered rocks below the low tide line at depths of about 350 from the central New South Wales coast to Rottnest Island, Western Australia.They have a long pipe-like snout with a small terminal mouth, feeding on small crustaceans. 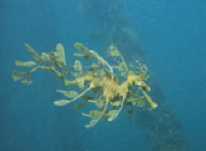 Though relatively common compared to Leafy Sea Dragons, Weedy Sea Dragons are also government protected in New South Wales and Tasmania, and subject to strict export controls. Though they are similar in appearance to sea horses, Weedy Sea Dragons do not have prehensile (gripping) tails, but rather appear to use them for steering. The beautiful colors of this sea dragon are highlighted by the iridescent blue bands along the upper body. Eastern Blue Groper, Achoerodus viridis. Males grey to blue, bright blue in sunlight, small juveniles green changing to brown, large females reddish brown. Juveniles (up to 10cm) in seagrass then moving to vegetated rocky reefs changing colour to suit habitat. Adults (maximum length 1.2m) venture over large reef sections and offshore to 40m. Found in estuaries and off shore along the NSW Vic East Coast. Although the blue groper is NSW's marine emblem, it is only protected from commercial sale and spearfishing. You can still catch them with a line. Project Officer, Dragon Search (SA). Leafy Seadragon, Phycodurus eques A colourful, spectacular fish, with incredible camouflage. It floats like a piece of weed, which makes it hard to find and also enables it to get close to prey. Males incubate about 250 eggs under their tail. Hatchlings are about 35mm long and adults to 35cm. Mainly found in coastal bays, unique to southern Australian waters. Under the South Australian Fisheries Act 1982, Section 42, it is prohibited to take a protected species. Leafy Seadragons are listed as a protected species under Part 6 of the Fisheries (General) Regulations 2000. This means it is prohibited to take a Leafy Seadragon for any reason without a ministerial exemption. If anyone would like more info then they can visit the Dragon Search website or call Jeremy on 08 8223 5155. Reference: Kuiter, Rudie H, Guide to Sea Fishes of Australia, New Holland, 1996. Zoological Parks and Gardens Board's has an Australian emblems web site with all the mammal, bird, marine and floral emblems for all states and territories.